my eyes are swimming from staring at this computer. all i'm thinking about is knitting projects. trying not to eat this bag of chex mix too quickly. 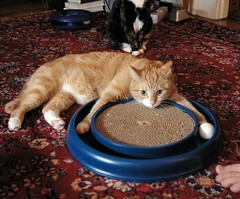 maybe the crunchies will keep me awakeish. thursday is more than 50% over. the work week is 70% over. i feel i am approaching the happy times. When Hannah and I went up to Freeport a couple weeks ago we visited the Bass Shoe outlet. I bought a pair of long knee socks for myself. Pretty stripe-ed ones. I think, maybe the first pair of knee socks I've ever bought. I'm thinking hand-knitted knee socks might be a little too warm. But these are great. one hour four minutes left. been a fairly ordinary day. i wrote a letter to an old friend. i'm curious to know how it's received, and wonder if i'll hear back from her. had subway for lunch. but i'm fairly certain that's not really interesting blog fodder. am frustrated with my employer. hannah banana works at the same place i do and they're not being flexible at all about her needs as a new mom. "you know what really grinds my gears?" even before i talked to hannah about said job situation i spent a significant amount of time looking at job sites online today. i'm experiencing ennui about where i'm at right now. and i can't decide if i just need a serious dose of perspective or if i need a change. either way i'm looking around. i ordered some knit picks wool of the andes, 8 skeins of black cherry heather, arctic pool heather, and forest heather. it arrived yesterday and i'm excited to do some swatches and plan some christmas knitting. i'm trying to decide if i want to take the time to decorate the house and my workspace here for christmas-time. it doesn't feel christmasy to me. we haven't seen any snow yet. i don't even need to wear a coat outside yet. :( maybe we'll get a chill soon. it's 6:00. i'm in my pajamas. on the couch. watching iron chef america. nothing on my plate. nothing that desperately needs to get done. i think i have time to knit. + 2 hours 45 minutes left. that's manageable right? - not so much to do around here today. not even so much to pretend to be doing. + exploring the world of podcasts. + staying in tonight. if all goes well i'll be pajama-ed by 5:15. leftover pizza for dinner. maybe i'll get to knit (no knitting for the past FOUR days). + not only have i not killed the plant hannah gave to me, but i think it's getting new leaves! + lists. i have a two-pager going in order to present the most wonderful thanksgiving on earth. with extra comfort & relaxation. + diet a&w root beer comes in an "old-fashioned" style bottle and it cracks me up. + which reminds me - this video cracks me right the hell up. and i can recite the whole darn thing in the annoying voice. - a&w root beer doesn't have any caffeine. darn. i'm hopping on the podcast bandwagon. i don't know why i haven't before because i've heard great things about lime & violet from folks like miss kc. i just subscribed to them via itunes. will listen to all back episodes. i'm wondering - what podcasts do you listen to? and what do you do while you're listening? i love love love Christopher Guest movies and i'm so excited to see this one. it comes out on november 17.
i'm toying with the idea of a Christopher Guest movie marathon this weekend. how rad would that be? i found this recipe this afternoon on allrecipes.com. it's called Best Baked Chicken. And it's MIGHTY good. I will definitely be cooking this for Chuck & Hannah at some point. i used fat free sour cream, and half the butter. now i just need to figure out the points and see if it's a recipe i can eat again. crazy me gave all the stuff i knit for baby penelope away without taking photos of it. luckily we had a photoshoot on saturday and momma hannah chose this as an outfit to photograph! 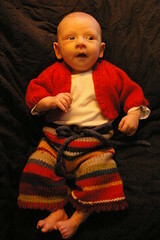 i knit the sweater and the pants!! am pooped now. just finished folding laundry, changing kitty litter, going to the grocery store, washing dishes, general pickup. watching an episode of alias. then going to bed. tiiiired. +hub bought me a chai at starbucks without me even asking. +boss is out today. this means potentially leaving early. which is why hub and i brought separate cars this morning. just in case. +there was a serious layer of frost on the windshield this morning. being someone who is NEVER in a hurry what did i do? put the defroster on high and while i waited i knit on the wool soaker i'm knitting for Penelope. hee. +i think this weekend paul is going to help me work up a basic but easily modifiable (is that a word?) template for my blog. he has computer hacking skills. until then i keep switching templates because i'm a little bored with what i've got. i love feeling like i accomplished something. yesterday i went to BJ's at lunchtime and picked up a few things and ordered contacts for myself. last night i: washed dishes, organized the pantry, emptied all the trashes in the house, did 5 loads of laundry (washed, dried, folded, put away), went to the grocery store for the stuff i couldn't get at BJ's, changed the sheets on the bed, AND i super-cleaned the stovetop (i'm talking taking out the burners & pans, and lifting the top of the stove to clean underneath, then taking off all the knobs and washing those and scrub scrub scrubbing everything). there were a couple things i was bummed that i didn't have the energy to do (like cook a good healthy dinner & vacuum) but overall i'm pleased with doing all that i did. we're not home as much as we used to be and the house tends to stay in disarray longer than i like. i'm going to try to work on that. this weekend's mission: cleaning the OVEN. sweet.